Look at this adorable display shelf! 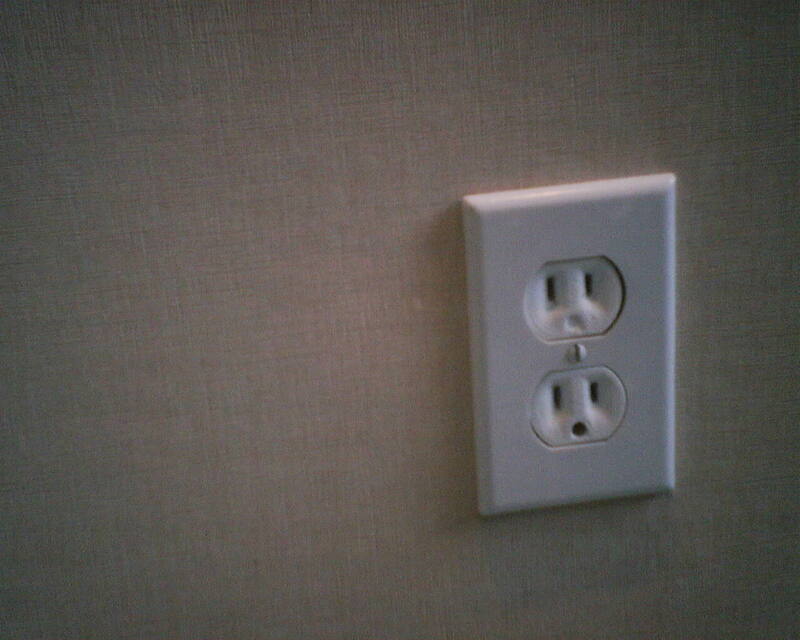 It is recessed into the wall, and has a cut-out in the “ceiling” for a small LED light, which will shine down on a decorative item inside. 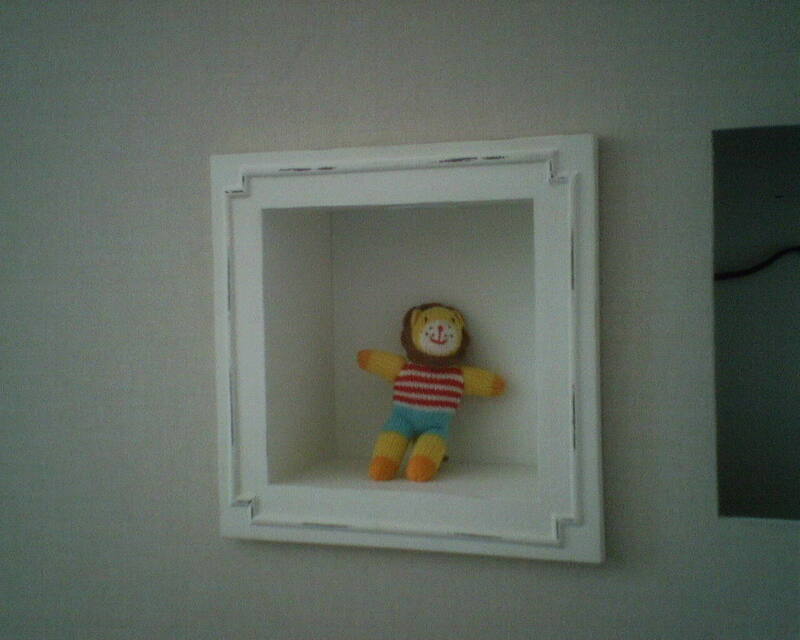 This was in a new-born baby’s nursery, and the whole wall will be covered with these niches, in various sizes. Very sweet. 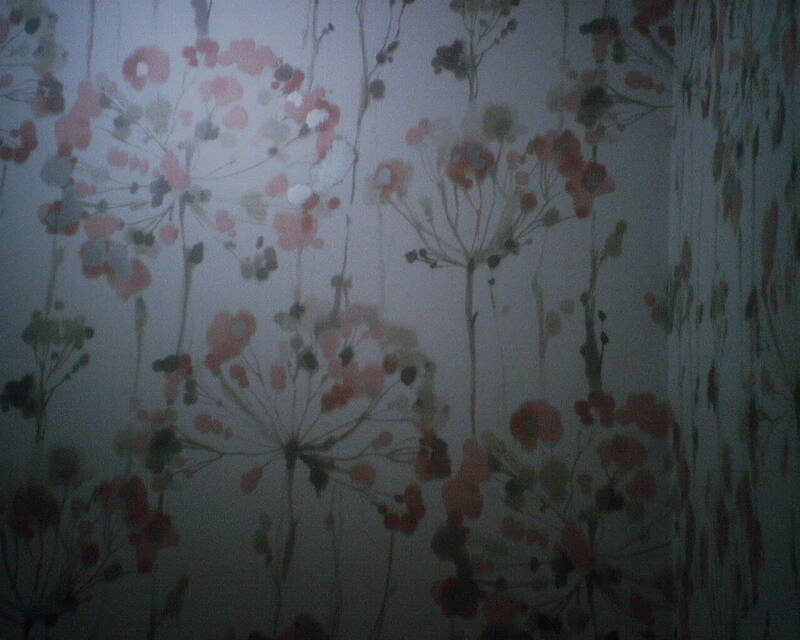 The new mother choose two wallpaper patterns for the room. 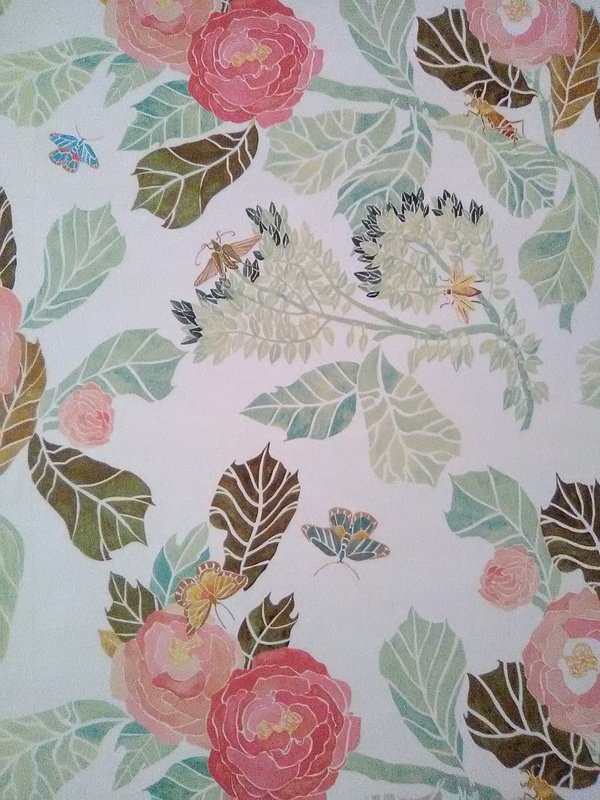 One has soft water color looking butterflies, dragonflies, and flowers. 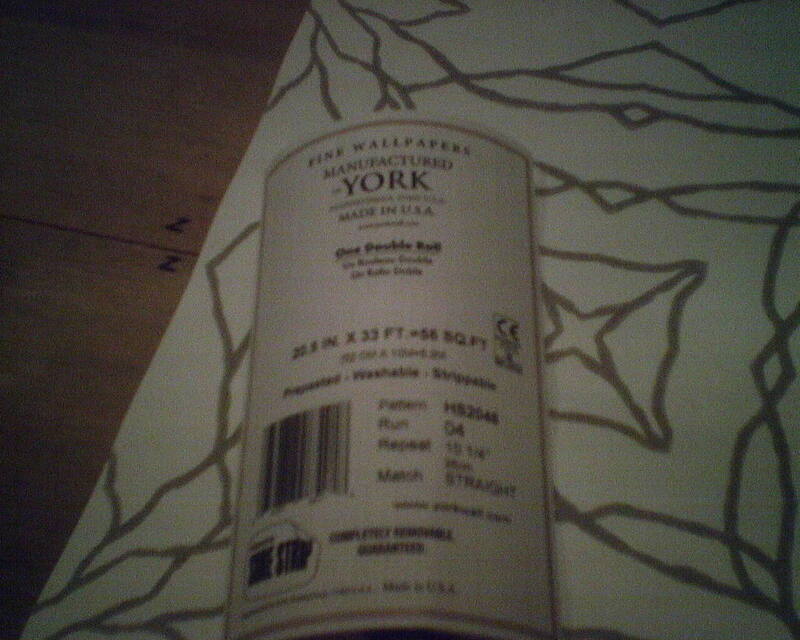 The other is a textured paper that has a linen look, in a light tan or cream color. That’s the paper that is a backdrop to these display shelves. Keeping the background calm ensures that the shelves and the items on them will remain the main focus. Fireworks or Dandelion Heads ?? 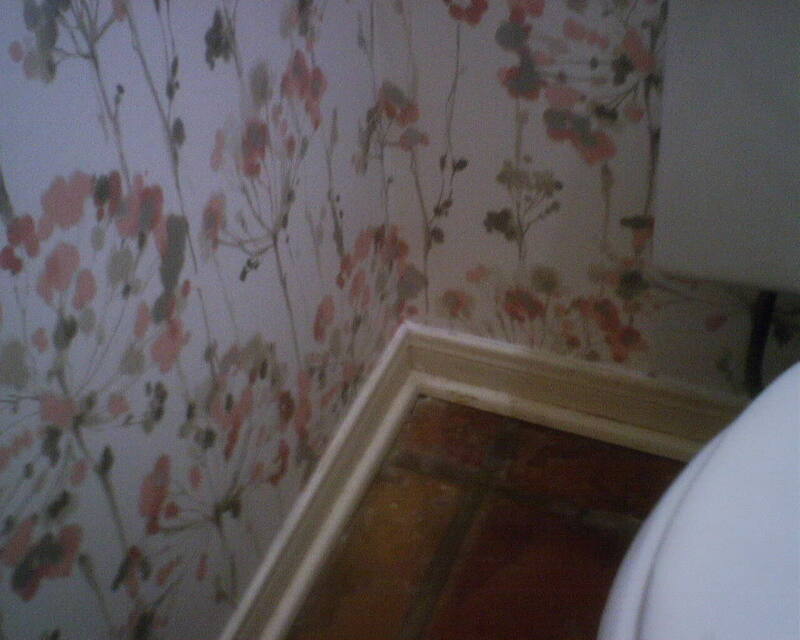 No matter if you see fireworks or flowers, this light colored pattern full of bursts of movement really transformed this powder room. 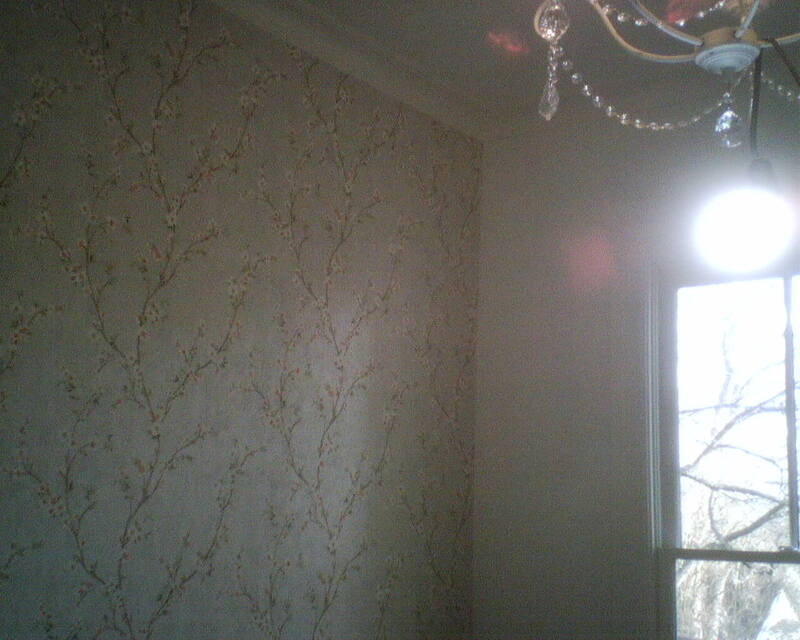 Originally, the room was papered a dark brick red color. 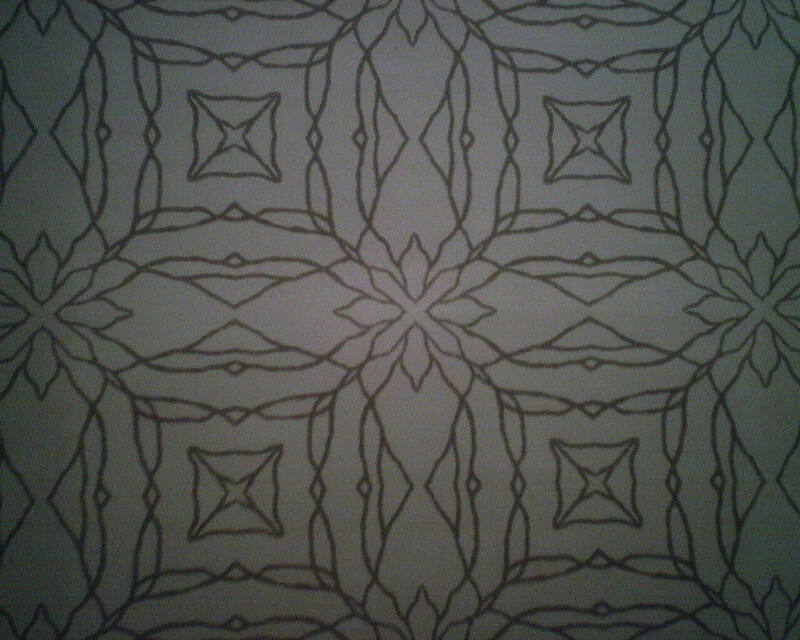 It was so dark that I could not even get a photo, plus the paper had no pattern, so you have to wonder why they didn’t paint instead. 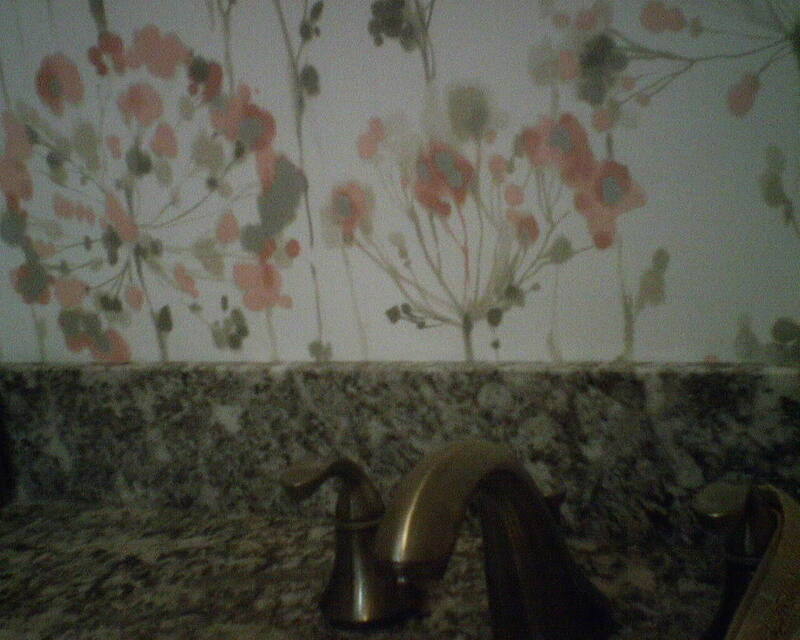 The homeowner searched hard to find a wallpaper that would coordinate with both her new grey granite countertop and the existing Saltillo tile floor, while brightening up a room that had been cave-like for decades. 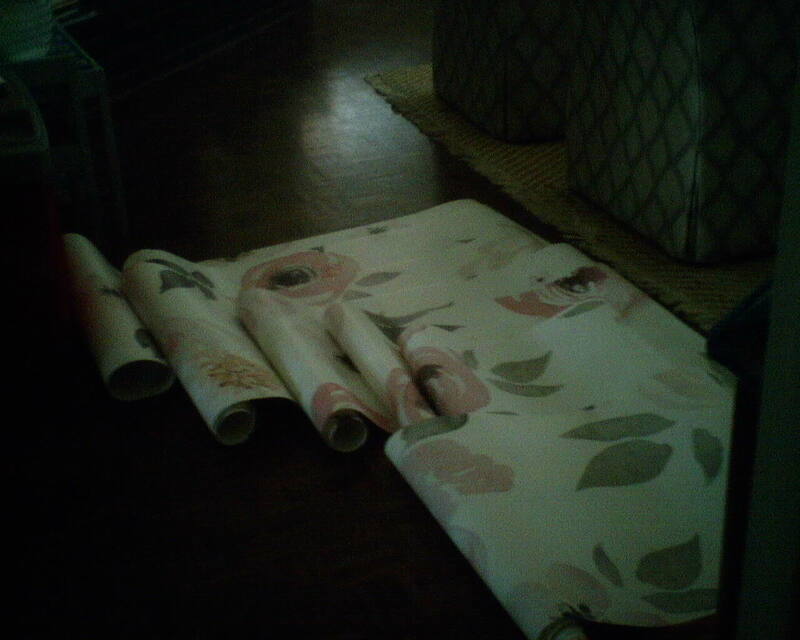 I would say that she was successful, because this paper fills the bill in every way. This home is in the Fondren Southwest neighborhood of Houston. 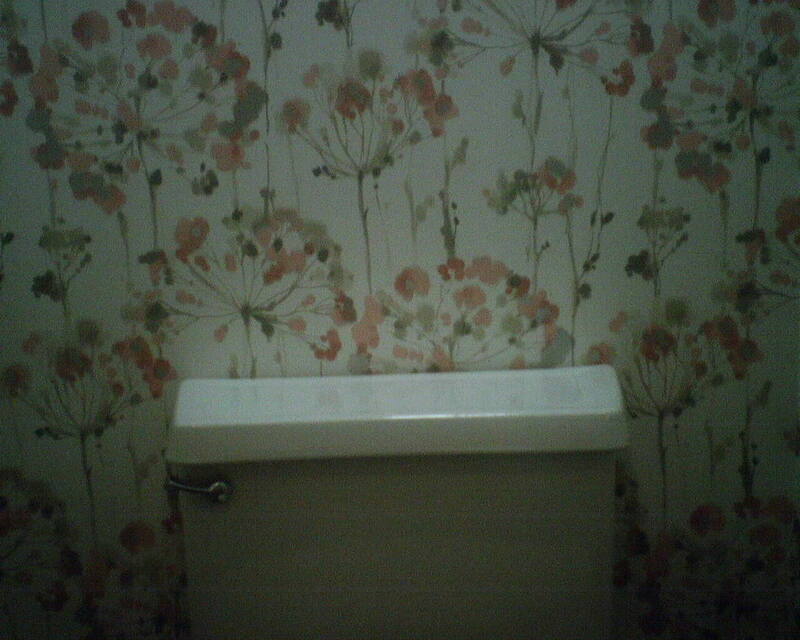 The wallpaper is by York, in their Candice Olson line. The label said it was unpasted, but it turned out to be pre-pasted. 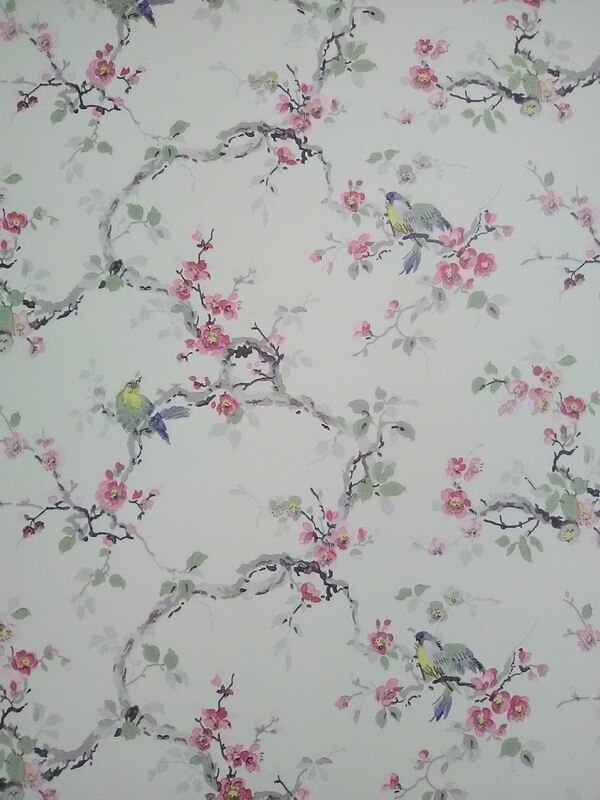 I pasted the paper anyway, and was very happy with the quality of the paper, and how nice it was to work with, and how tight the seams were, as well as the overall finished job. Life at home will never be too serious when walking through the front door is this fun! 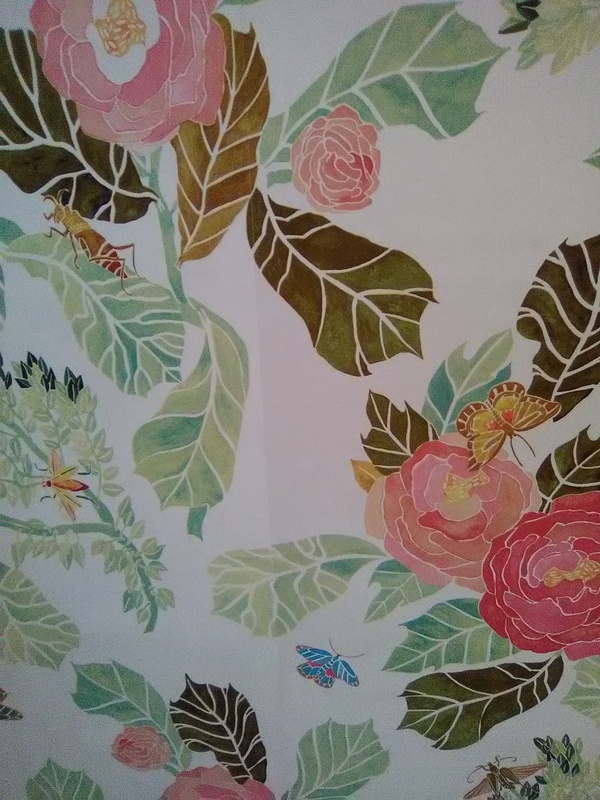 The homeowner is the mother of a toddler and a newborn, and she chose this light-hearted pattern for the entry of their beautifully renovated and updated 1958 ranch style home in the Spring Branch area of Houston. 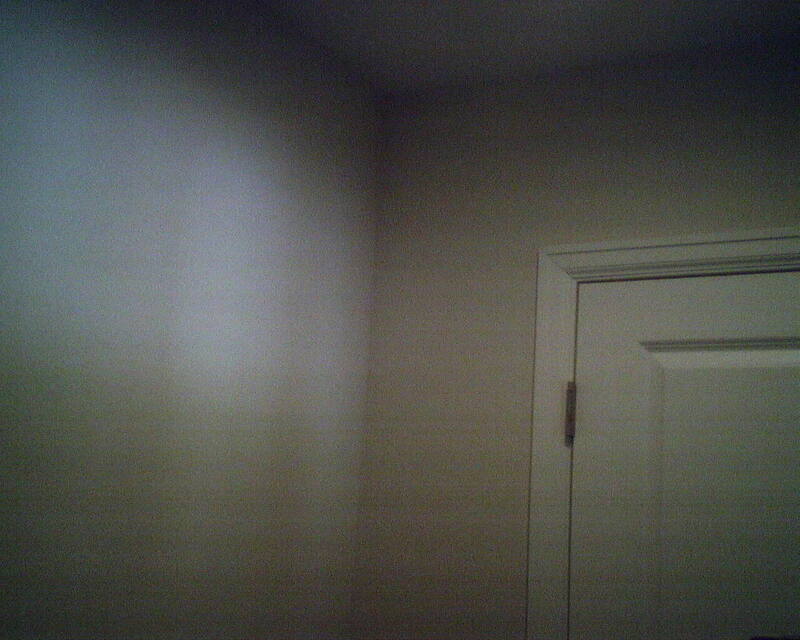 Originally, the entry felt small and unwelcoming, and the walls had a heavy texture that was, well, it was icky. I smoothed the walls, which took a long time, mostly waiting for the smoothing compound to dry, before I could sand it smooth and roll on a primer. 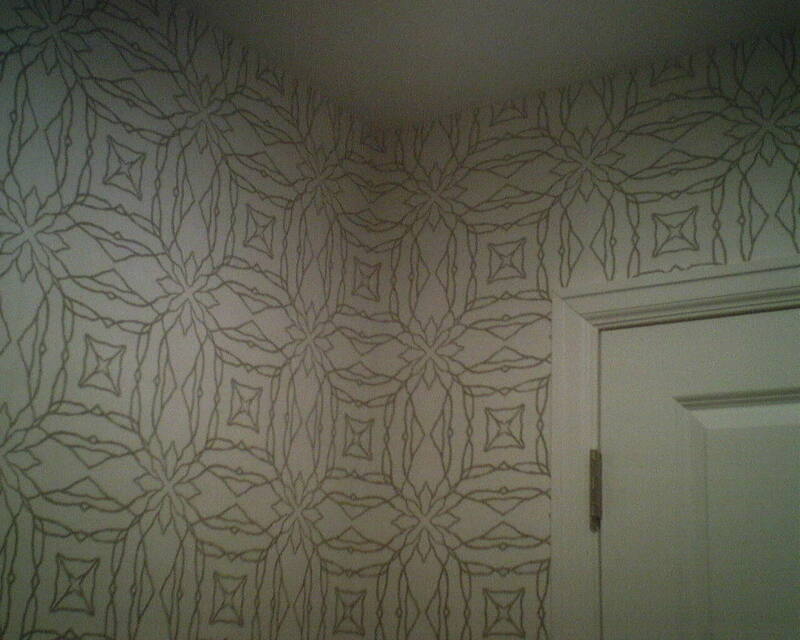 This playful pattern looks like someone took a grey Sharpie and drew star flowers and squares on the wall. 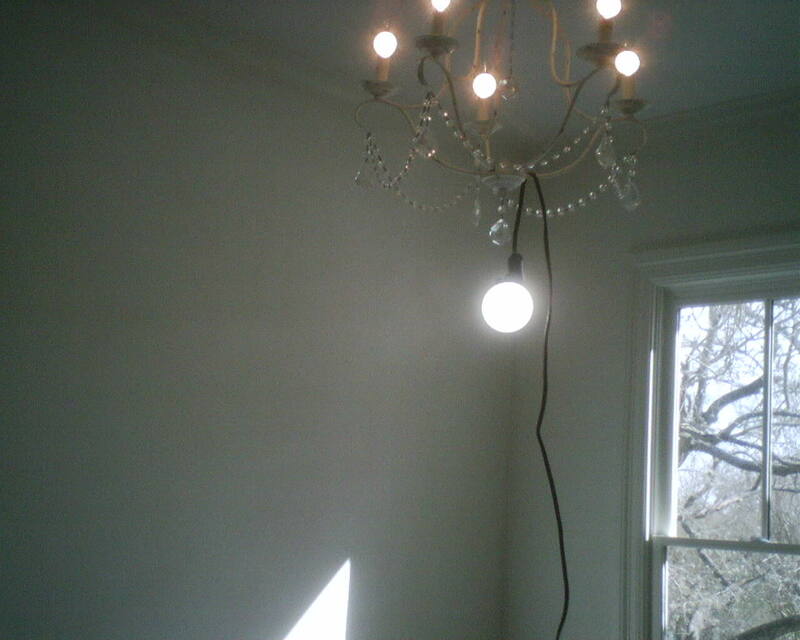 It really expanded the space visually. The entry is now something fun and inviting to step into. Since the entry can be seen easily from the living room and the great room and kitchen, it interjects a playful mood into the rest of the house. 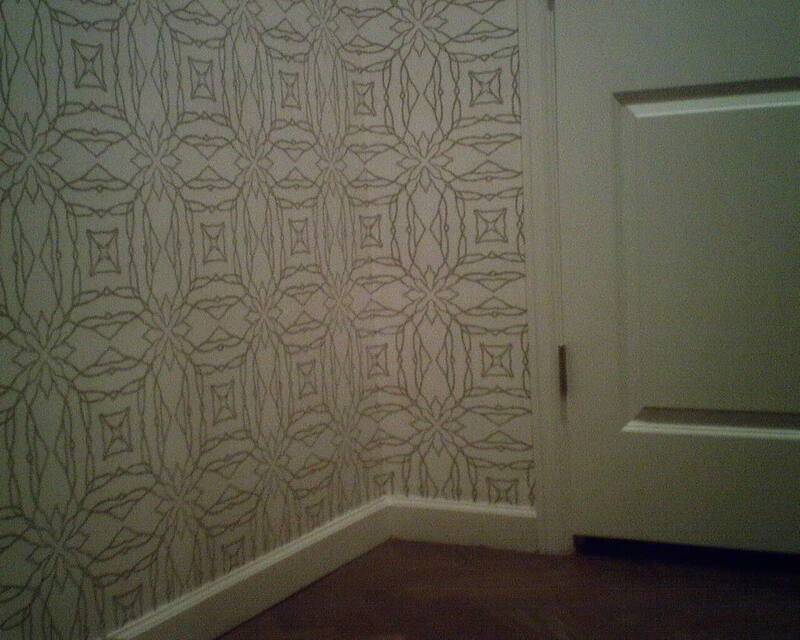 This wallpaper pattern is from the Sure Strip line by York, one of my favorite brands, for many reasons. 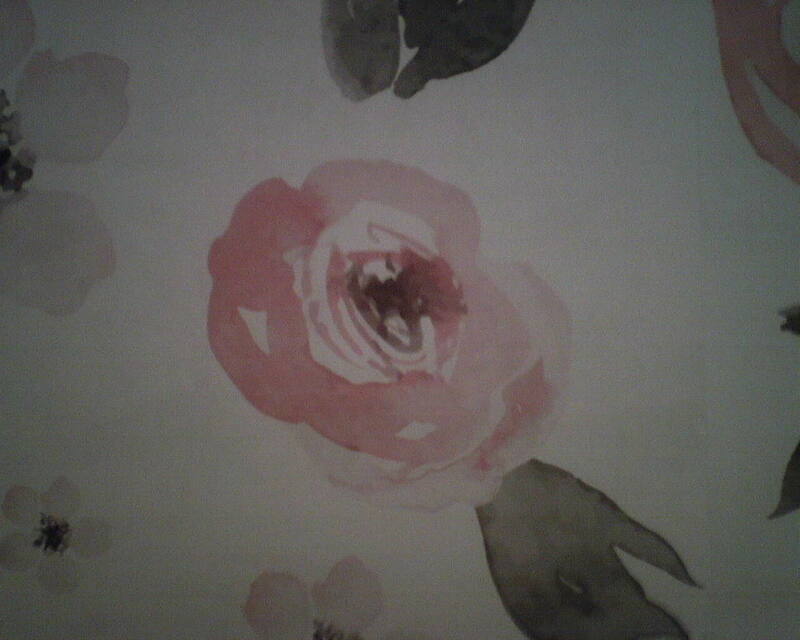 I like the “raised ink” texture to the paper. 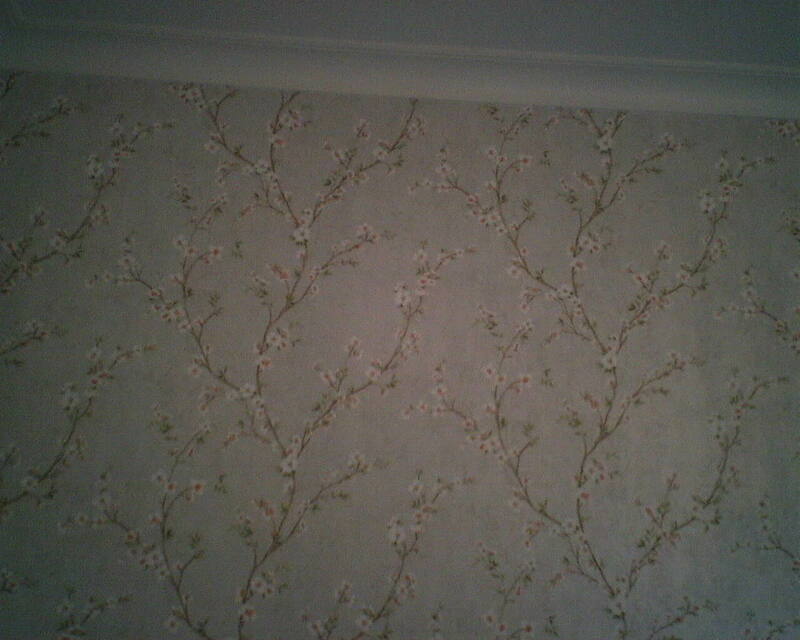 The thin paper will dry flat and hold tightly to the wall. 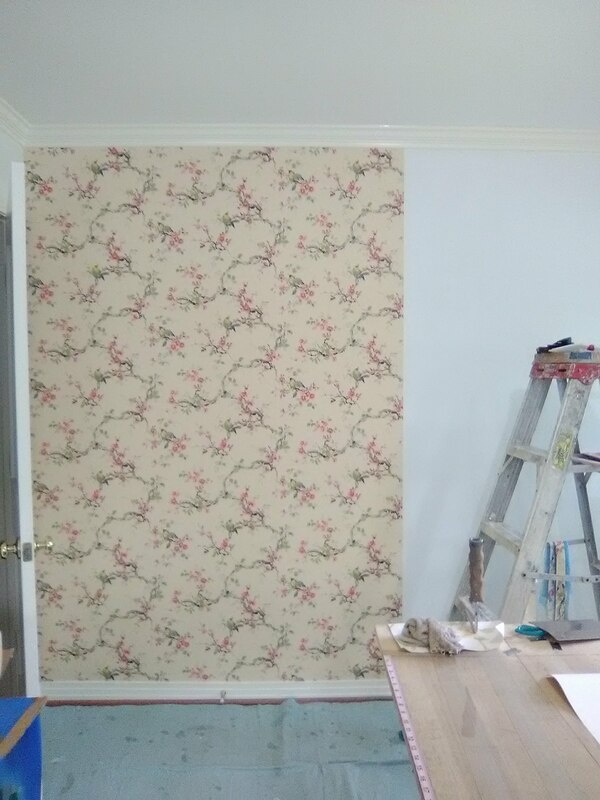 Yet the material was developed so that, when it comes time to redecorate, it should strip off the wall easily and in one piece, with no damage to the underlying surface. On top of all that, it comes pre-pasted, and is very nice to work with. 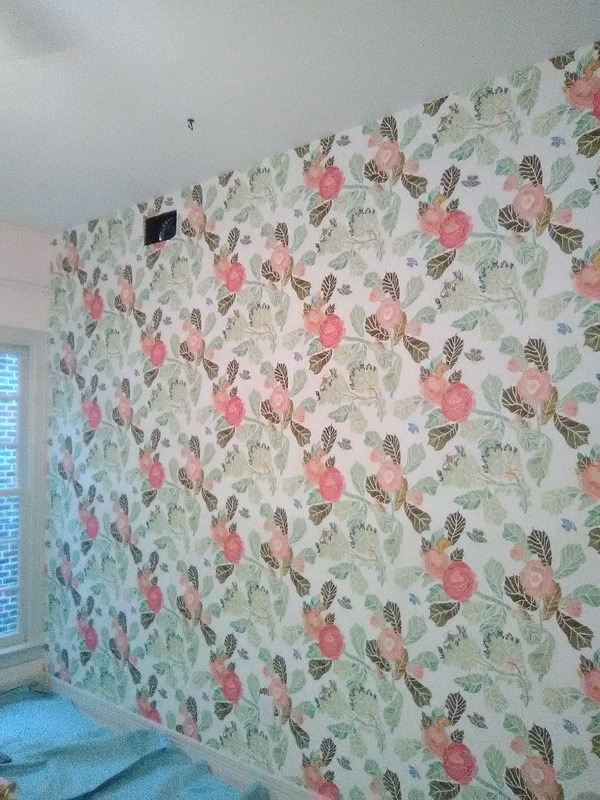 Even though I was battling a regimented pattern in a room full of unlevel ceiling, un-plumb walls, and crooked corners, the finished project turned out fantastic. 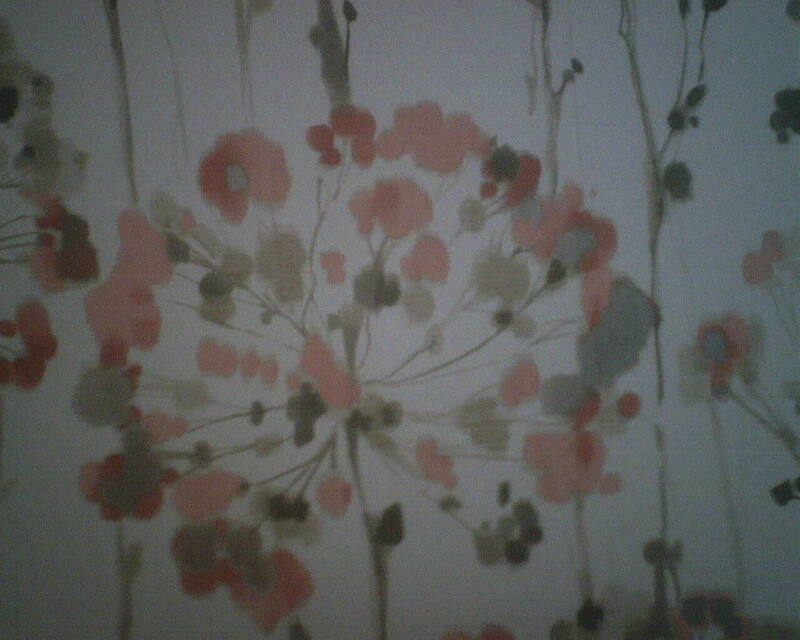 This wallpaepr was bought at below retail price from Dorota Hartwig at Southwestern Paint on Bissonnet near Kirby. (713) 520-6262 or dorotasouthwestern@hotmail.com. She is great at helping you find just the perfect paper! Discuss your project and make an appointment before heading over to see her. 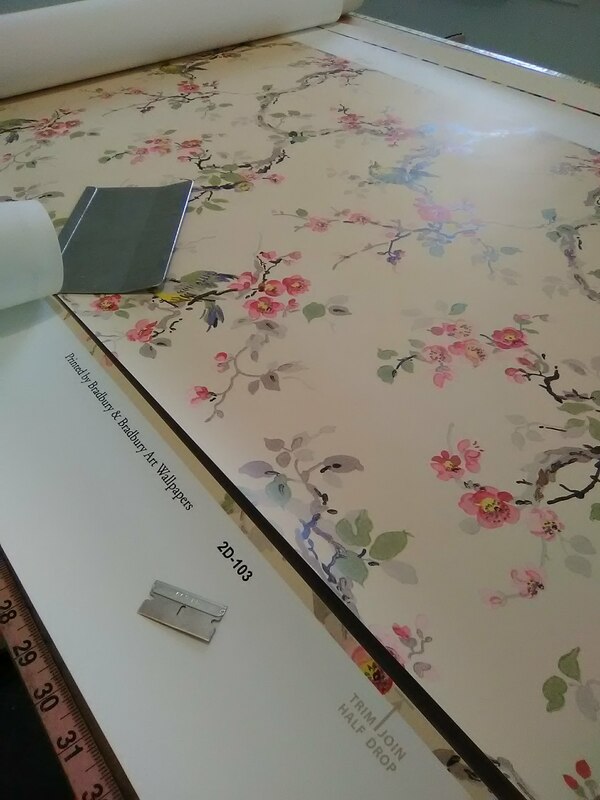 It’s easier to find beautiful shimmery Chinoiserie murals on HOUZZ – than it is to swallow the price tag … Some of those you see pictured are very high-end, meaning, $1000-$10,000 per panel. I suggested this homeowner go visit Dorota (read below) and she was able to find a very similar design and color that she loves, for a very reasonable price. 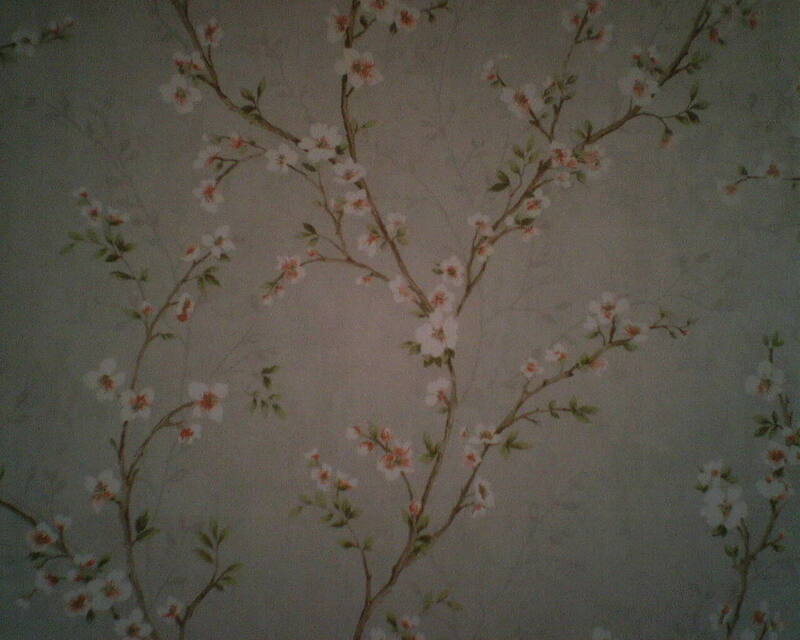 It has just enough of the Asian look, and the flowers look like they are hand painted on. It compliments her mirrored desk and side tables, and it offers a bit of upscale shimmer, but does not overpower the room. 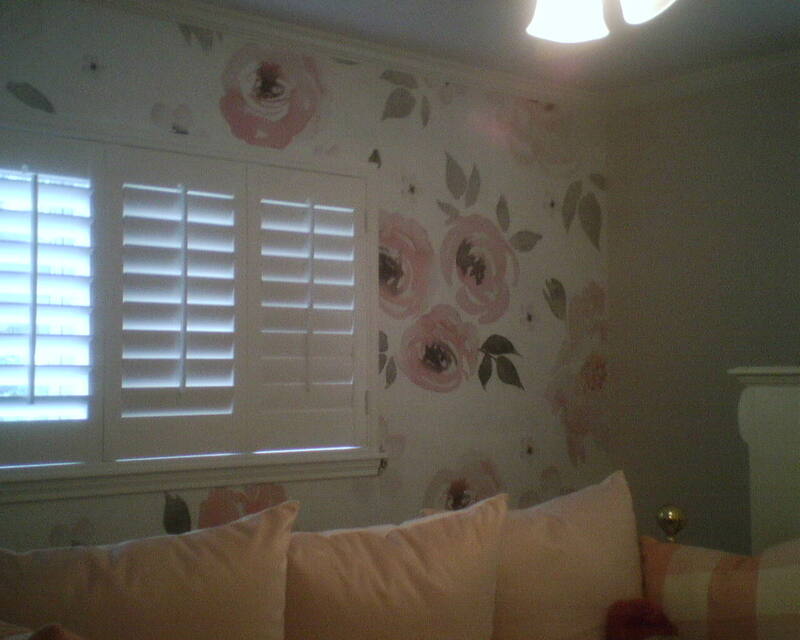 The soft colors blend nicely with the rest of the house. 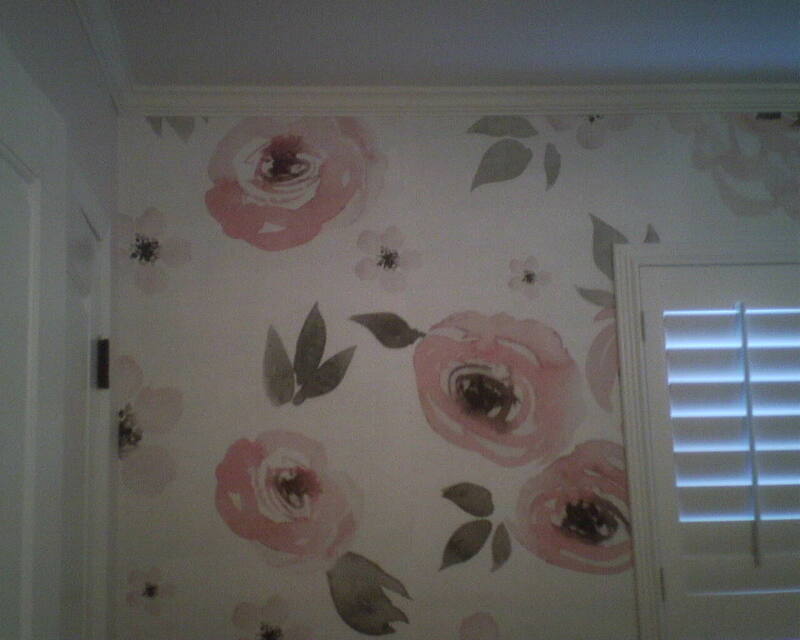 The homeowner will probably pick up some of the soft peach color from the flowers as an accent color in other areas of the room. 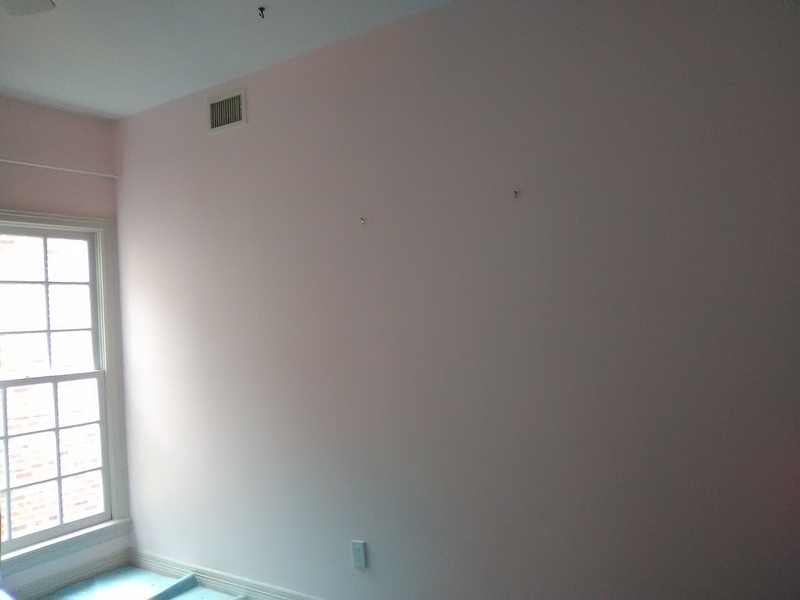 I’m hoping she will paint the other three walls this color. 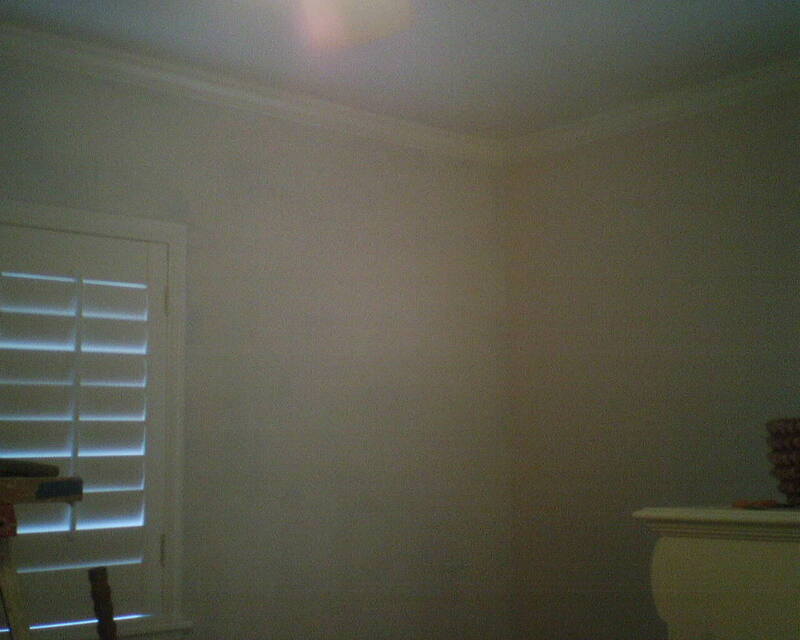 I hung this on one accent wall of a second floor home office, in a new home in the Houston Heights. 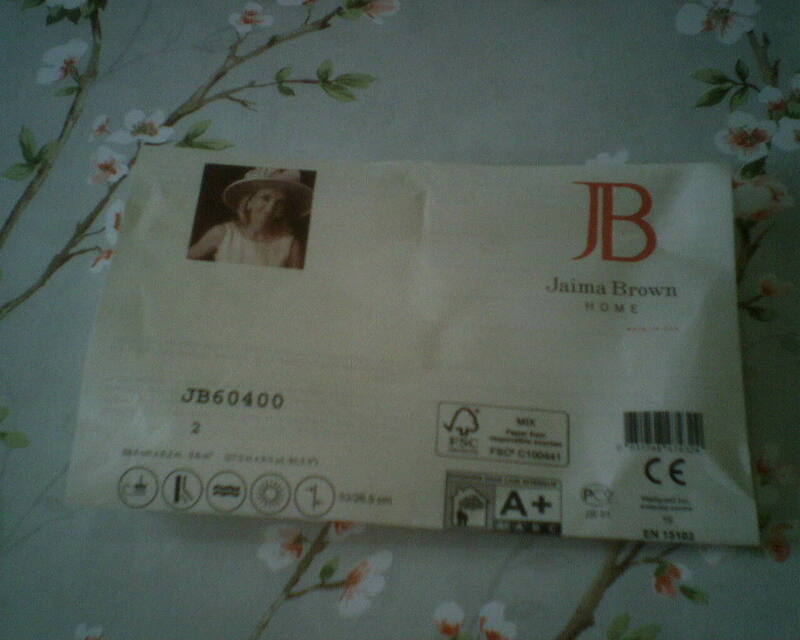 It’s by Wallquest, in their Jaima Brown Home line. 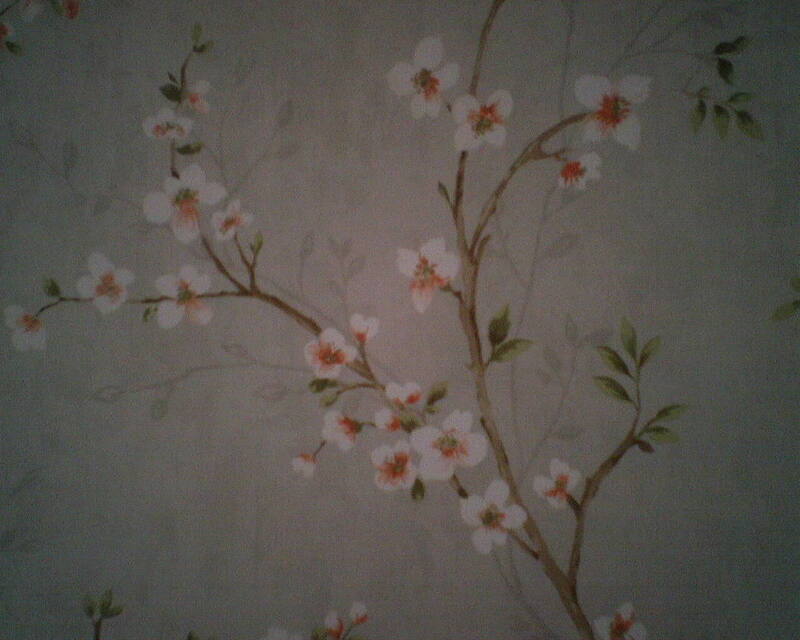 This wallpaper was bought at below retail price from Dorota Hartwig at Southwestern Paint on Bissonnet near Kirby. (713) 520-6262 or dorotasouthwestern@hotmail.com. She is great at helping you find just the perfect paper! Discuss your project and make an appointment before heading over to see her.